QU Huiling, ZHAO Chuansheng. Effects of Constraint-Induced Movement Therapy Combined with Antidepressant Treatment on Recovery after Cerebral Infarction in Rats[J]. Journal of China Medical University, 2018, 47(12): 1085-1088. Abstract: Objective To determine whether constraint-induced movement therapy (CIMT) combined with antidepressant treatment could influence neurogenesis and recovery after cerebral infarction in rats. Methods Adult rats were divided into a sham group, an infarction group, an infarction treated with CIMT group (CIMT group), and an infarction treated with CIMT+fluoxetine (FLUO) group (CIMT+FLUO group). Infarction was induced with endothelin-1 (ET-1). The healthy forelimbs of rats in the CIMT group were restrained in plaster casts. Rats in the CIMT+FLUO group consumed water with fluoxetine for 3 weeks. The expression of doublecortin and 3, 3'-diaminobenzidine was measured using immunohistochemistry techniques, and motor function was evaluated with a beam walking test. Results CIMT enhanced the proliferation of neuroblasts (P 0.01) and behavioral recovery (P < 0.05). CIMT combined with antidepressant treatment in CIMT+FLUO group had no effect on neurogenesis and recovery compared with CIMT group (all P > 0.05). 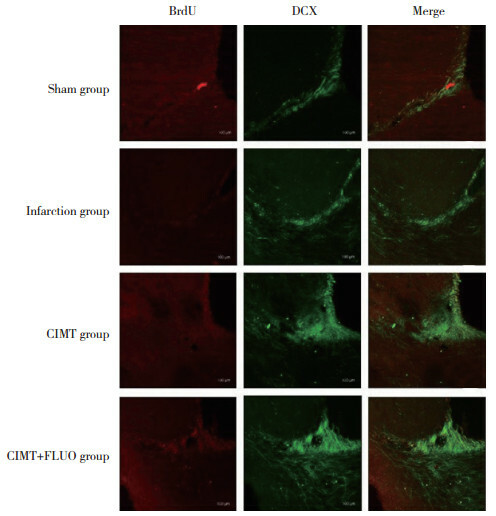 Conclusion CIMT could enhance the neurogenesis and recovery after cerebral infarction, and there are nofurther promotion on CIMT combined with antidepressant treatment.